In that time, he’s witnessed – and participated in – some of the world’s most pivotal moments. And while many who are lucky enough to reach that age become forgetful, Black is not one of them: He is still able to recall, clearly, exact addresses and dates from more than half a century ago. It’s fitting that a man who made his living as an historian would live to see so much of it. He attended Burke Elementary and DuSable High School. Later, the bombing at Pearl Harbor interrupted his 23rd birthday. While serving in Europe during World War II, a visit to Buchenwald concentration camp would cement his passion for working to make the world better. Black went on to college at Roosevelt University, then earned a master’s degree from the University of Chicago before becoming a teacher. 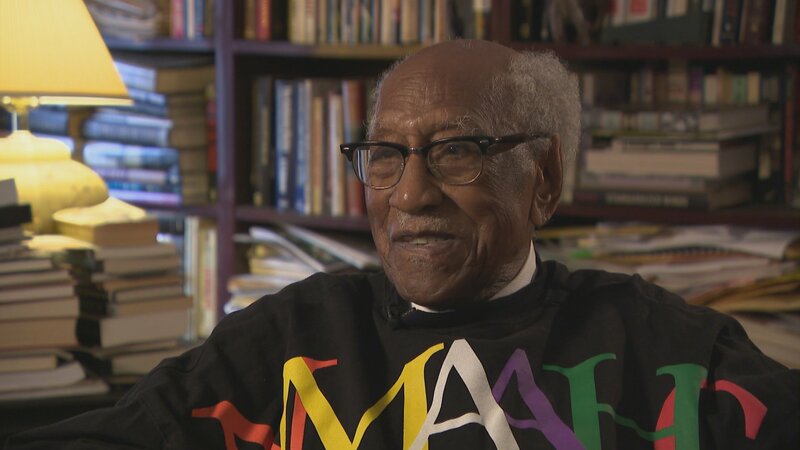 In 1955, he heard the voice Dr. Martin Luther King Jr. on the television. “He articulated for me the way we felt, the way we’d felt in the combat of WWII, but continued to be good Americans,” he said. Black would work with King when he came to Chicago, and he helped organize the Chicago contingent that went to Washington, D.C., for the historic March on Washington. “The attitude that had been inspired by my mother and father that a change is going to come, the door is going to open, be prepared to walk in. That attitude of optimism that I inherited from childhood continued throughout my life,” Black said. Working with King wouldn’t be his last chance to help open another history-making door. Though he ran – and lost – his own race for Chicago alderman, he did help Chicago elect its first black mayor, Harold Washington. Washington calls Black a Chicago treasure – she recalls a trip to Senegal and Mali in Africa years ago, when they both taught at City Colleges of Chicago. “To be able to connect our lives in Chicago and the discrimination and racial injustice that we were struggling with then and now, with that history back in Africa,” she said. Black is a consummate teacher, with knowledge that comes not only from his research – but also his life. Another moment he was there for: seeing the country elect its first black president, Barack Obama. This weekend, a number of organizations are gathering to host A Centenary Symposium on the Life and Times of Timuel Black on Saturday, as well as a 100th birthday party on Sunday.